I do remember now crouching on the stairs, curling my fingers under the frayed edge of the carpet, tucking the ring out of sight. I was only six or seven at the time and I had lost my own gold ring and been punished for it. It’s hard to say if I wanted my sister to suffer the same loss as I had or if I wanted her to be punished too. I suspect it was the latter. My gold ring did eventually turn up: a girl in my class had it. We had been playing weddings and we needed a ring for the ceremony. She had kept it after the game and it was under her bed for weeks before her mum found it and made her give it back to me. By that time I had probably forgotten about Barbara’s ring. I don’t think I intended it to stay hidden under the stair carpet for twenty years. I feel so desperately sad at the idea that my sister was missing her ring all that time. I remember how devastating it is to be a child and to lose something precious. I feel guilty too, and it’s no consolation knowing that she has been reunited with her ring at last because what good is it to her now? She could wear it as a toe ring I suppose. I guess it’s the writer in me but my first reaction to any strong emotion like that is to want to put it into a story. I recently read Sally Zigmond’s post on turning real life situations into short stories. It made me realise that I’m going to have to consider very carefully how much truth goes into my short story and how much fiction. I have a tendency when I write short stories to leave the ending open. That seems more honest to me than tying everything up neatly, because in real life there are no neat conclusions. However, as Zigmond points out, real life is not fiction. When people read short stories they have certain expectations that need to be satisfied, among them a beginning, a middle and an end. The real life ending of my ring story is not very satisfying so I need to create a new, fictional one. Writer Nicola Morgan says on her blog that you don’t need a neat ending, but you do need the reader to feel that at least some good degree of resolution and partial closure has been reached. So how do I do this? I was watching an episode of Frasier the other night, the one where Frasier and Niles take up the floor boards of their childhood home searching for a memory box they hid there as children. They do find the memory box, but also a human skull. Before calling the police, they decide to try to solve what they believe to be a murder case themselves. The starting point of that story is the same as mine: something hidden in childhood being found decades later. It might well have been based on an experience of the screenwriter. However, from that starting point the story moves in surprising directions, encompassing a police investigation, some hilarious theories and inevitably, a catastrophic misunderstanding. There is a definite sense of resolution at the end of the episode and I am reasonably sure that this latter part of the story is entirely fictional. Something for me to think about when it comes to writing my short story based on the reappearance of my sister’s ring. 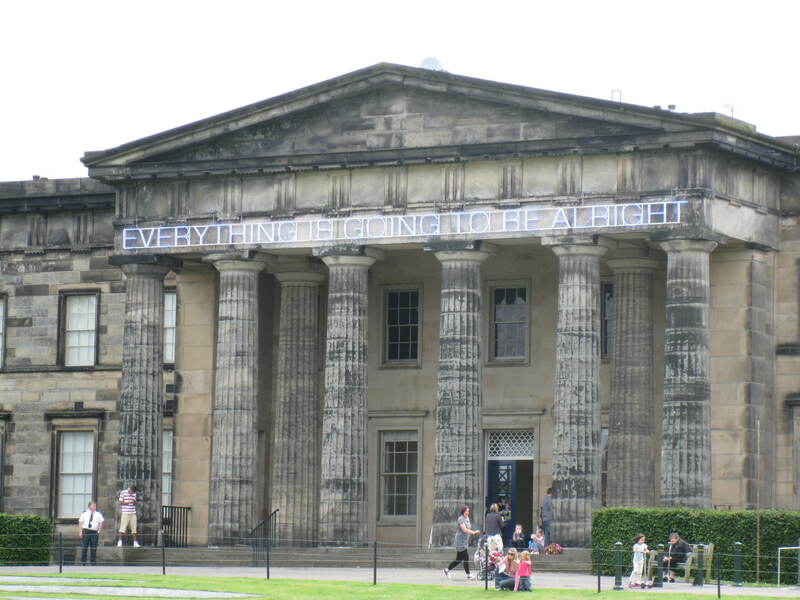 EVERYTHING IS GOING TO BE ALRIGHT declares the neon blue sign emblazoned across the Gallery of Modern Art in Edinburgh. My sister says that on a bad day, seeing that message makes her feel warm inside. Having read Fleur Adcock’s persuasive argument in Mslexia on why “all right” is two words and not one, the sign just makes me feel irritated. Last week while visiting the gallery, a teeny newspaper clipping pinned to the noticeboard caught my eye. The National Galleries of Scotland are running a competition for short stories or poems inspired by one of the works in their collection. Entries can be up to 1000 words and the deadline is 22nd January 2010. Don’t worry if you are unable to get to Edinburgh to view the collections; many of the works are displayed online. My favourite works in the Gallery of Modern Art were the Cindy Sherman photographs and the Liechtenstein painting. Funny though, that the work that sticks most strongly in my mind is that bloody annoying neon blue sign. That’s why I’m getting my nose straight back to that grindstone (tomorrow, after a good night’s sleep).